Veitchia montgomeryana also known as Montgomery Palm grows to 25 - 80 feet and is best suited for zones 10B - 11 where it is fast growing. It requires moderate to high light, and is moderately drought and salt tolerant. It grows on a solitary trunk with a canopy of 8 to 10 ten foot long fronds. 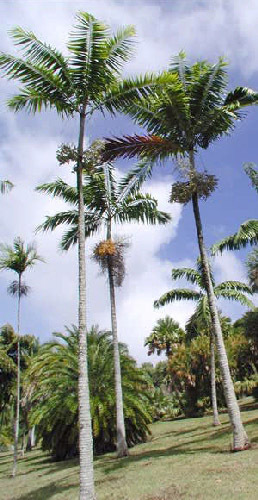 This palm is similar to the Joannis palm, but its fronds do not droop and it doesn't grow as tall. In summer, it bears yellow flowers followed by fruit that ripens to bright red. This palm's origins are Venuatu, an island off the coast of Australia where it is threatened in the wild because of harvesting for the edible palm heart.